Pittsburgh's Nick Bonino picked up his 18th point of the Stanley Cup playoffs, setting up Carl Hagelin's goal to tie the game at 2-2, but the Sharks went on to a 4-2 win, keeping the series alive and setting up game six in San Jose. Buffalo Sabres blogger Jordan LaBarber spoke with Charlie McAvoy, Kieffer Bellows (photo) and Clayton Keller at the NHL Combine. Robbie Baillargeon, who completes his degree at BU this summer, is headed to the newest NCAA hockey school, Arizona State, as a graduate transfer. He’ll be eligible to play for the Sun Devils in the 2016-17 season. 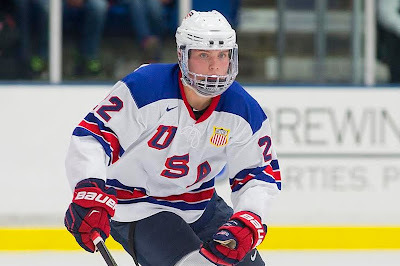 ► Future Considerations: Keller #7, Fabbro #13, McAvoy #14, Bellows #16, Krys #61. The first rankings of incoming NCAA freshman is out, courtesy of USA Hockey referee and scout Carl DeLucia. His list has: Forwards-- Keller #1, Bellows #3, Patrick Harper #18; Defense—Fabbro #1, Krys #3; and Goalie—Jake Oettinger #1. Former Terrier assistant captain Justin Courtenall and the Allen Americans have won the ECHL Kelly Cup.